Four walks and a hit batsman (plus the complimentary runner on second base) were how Portland managed a three-run 13th-inning rally without notching a hit. The rally was enabled by a yeoman's performance from Jake Cosart. Brought in for the 11th, Cosart held the Phils scoreless in his first two innings of relief, despite the man-on-second rule. Cosart struck out four in his three innings, allowing one hit and walking one. Starter Kevin McAvoy gave up just two runs on two hits in 5 1/3, but control continues to be an issue for the Bryant College product as he walked four and hit a batter. Tate Matheny led the way at the plate, going 3 for 5 with a walk, two runs scored, and two RBI. As the youngest player in the Carolina League by eight months, Bryan Mata is single-handedly skewing the age-advancement scale. His aggressive placement did not phase the 18-year-old in his season debut. Mata went five scoreless innings, allowing four hits and striking out four. His control was wobbly early, as he walked one in the second and two in the third, but he settled in and closed out his outing with a perfect fifth. Santiago Espinal provided the offensive spark from the leadoff spot, going 2 for 4 with two doubles and two runs scored. Bobby Dalbec added an RBI double, while Brett Netzer was 1 for 3 with a walk, RBI, and run scored. The Drive fell to 2-4 despite the continued efforts of CJ Chatham. The 2016 second-round pick got the start at DH and went 2 for 4 with two RBI. Chatham has hit safely in all five games he has appeared, notching multiple hits in four of them. Everlouis Lozada extended his hit streak as well, going 1 for 4 to get to six straight. Neither side put on a defensive clinic, as Greenville's four errors were outdone by six Lexington miscues, leading to five of the game's nine runs being scored unearned. Only two of the four allowed by starter Jhonathan Diaz were earned in his 5 2/3 innings of work. Diaz added seven strikeouts, giving him 16 through 11 2/3 in two starts. Player of the Day: Overshadowed by the Mata outing, William Cuevas quietly led the PawSox in his reunion. Cuevas was originally signed back in July 2008, and went on to appear in 165 games from 2009 through 2016, including three at the major league level. 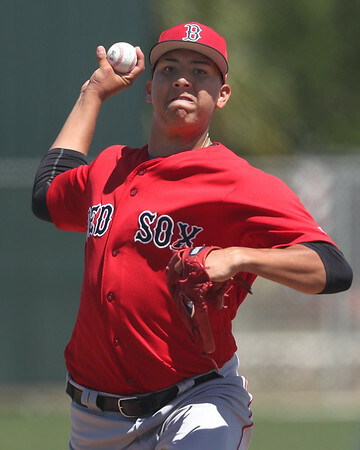 The 27-year-old was named a SoxProspects.com All-Star back in 2012, along with future major league regulars Xander Bogaerts, Jackie Bradley, Jr., and fellow 2008 International signee Junichi Tazawa.